Although the biblical period before the Jewish people returned from Babylonian captivity is linked with “modern Orthodox Judaism,” it differs in many ways from Abraham’s worship of the Creator, Moses’ giving of the Law, and David’s dynamic relationship with the God of Israel. Our journey begins when the Jewish people were allowed to return to Israel and Judah from their captivity in the land of Babylon. The following dates are approximate for sake of simplicity. Ezra had a large part to play in this transitional period. The Jewish people had just returned to Israel from Babylon. They brought with them many differences in culture and understanding. They now were better versed in Aramaic than Hebrew, and were in need of scholars, teachers and scribes to help them understand the Scriptures and teachings of their ancestors. Because of this need, Sopherim, “men of the book,” were trained and commissioned by Ezra to teach the people. They became the religious leaders of this era. ­By 135 B.C. two primary, but different, different Jewish parties, or religious groups, arose in Judaism: Pharisees and Sadducees. The Parushim or “pure ones” (Pharisees) were in opposition to the priestly ruling class party of the Tzadoksim or “the descendants of Zadok.” Do you remember Zadok? He was a Levitical priest descendant from Aaron and Eliezer who lived in the time of David. The Sadducees claimed to be descended from him. They were the priestly party and were the Temple custodians. They didn’t accept the oral tradition, or believe in the resurrection of the dead. The Pharisees, in contrast, were the party of the people. They wanted purity, a biblical foundation, and righteousness. They believed in the supernatural (including the resurrection), but due to their zeal for righteousness, greatly and wrongfully emphasized the traditions and man-made interpretations of Scripture, so as to avoid error and corruption. To use modern terms, they wanted to “build a fence” around God’s commands to help them avoid even the possibility of breaking one. Their intentions were good at the onset, but the fence soon replaced not only the commands themselves, but also the biblical need to have a circumcised heart. The Sadducees and Pharisees are prominent in the gospel accounts of the New Testament. They were normally as opposed as to each other as Democrats and Republicans are today. They did agree on one thing: neither group accepted Jesus as the Messiah. Although we read primarily of Pharisees accepting Jesus and not Sadducees – Nicodemus, John 3:1-10, who later defended Jesus before the Sanhedrin, John 7:50-51, and was present at Jesus’ crucifixion to help bury Jesus, John 19:39; many of the early Christians were Pharisees, Acts 15:5; and the Apostle Paul, Philippians 3:5. There were other groups at this time as well such as the Essenes. With the destruction of the Temple in 70 A.D., the Sadducees died out as a religious party. The Parushim however, flourished. Pharisaism was now, for all intents and purposes, Judaism, and Judaism, Pharisaism. All of Judaism today therefore, is descended from the Pharisaism of the first century. The word “orthodox” comes from two Greek words meaning “right opinion.” The term “Orthodox” soon grew on the traditional Jewish crowd, and eventually brought about even a sense of pride that they had the correct set of beliefs and practices, and still held to them even when others have strayed. The Creator is the Creator and Guide of all the created beings, and that He alone has made, does make, and will make all things. The Creator is One and Alone; that there is no oneness in any way like Him. He alone is our G-d – was, is and will be. The Creator is incorporeal; that He is free from all anthropomorphic properties. He has no likeness at all. The Creator is the first and the last. The Creator is the only one to whom it is proper to pray, and that it is inappropriate to pray to anyone else. The prophecy of Moses our teacher was true; and that he was the father of the prophets, both of those who preceded and of those who followed him. The whole Torah which we now possess was given to Moses, our teacher. This Torah will not be changed, and that there will be no other Torah given by the Creator. The Creator knows all the deeds and thoughts of human beings. The Creator rewards those who observe His commandments, and punishes those who transgress them. I believe with complete faith in the coming of Moshiach (Messiah), and although he may tarry, nevertheless, I wait every day for him to come. I believe with complete faith that there will be resurrection of the dead at the time when it will be the will of the Creator. What you see within these statements is the closest thing Judaism has to “Articles of Faith.” Items not mentioned and/or dealt with here are certainly up for debate and varying interpretations. Even items mentioned here are interpreted in a wide variety of ways. Orthodox belief in God as the Creator does not necessitate that He created everything in six literal, 24-hour days, nor does it mean He created everything out of nothing. If we would think, “they’re just like us,” regarding a literal interpretation of Scripture, we would in many cases be incorrect. Many core beliefs that we have as Bible believing Christians are not necessarily hard and fast within Orthodox Judaism. Much of what you and I hold as fundamental doctrinal beliefs are generalized or taken symbolically within Orthodox Judaism. Many spiritual truths are thought of as poetic generalities such as there being none righteous. Even the idea of Hell as we understand it is interpreted in many different ways within Orthodox Judaism. Within Orthodox Judaism a great emphasis is placed upon the Law or Torah. It should be noted, that when speaking of the Torah, both the “written Torah” and the “Oral Torah” are implied. This is in reference to the rabbinic writings such as the Mishna and the Gemara which make up the Talmud and give the interpretation of the written Torah. Both are thought to be divine. There is a great emphasis on tradition as well as the physical realm. Much of what doesn’t fit into those two categories is secondary in importance. The main difference between the Orthodox and Ultra Orthodox (or Hassidic Jews) is the degree that they separate themselves from the outside world so as to avoid defilement. Circumcision: the removal of a male’s foreskin at 8 days of age. Keeping kosher: following the Mosaic dietary laws. Wrapping tefillin: worn (mostly by men) during weekday morning prayers. They are small boxes containing Scripture and are connected to leather straps. One is placed on the forehead, and the other is placed on the arm (usually left) with the strap wrapped 7 times around the arm, and then a specific way around the hand and fingers. Keeping the feasts of Israel, and the various traditions associated with each feast. Wearing tzitzit: ritual fringes attached to either a prayer shawl, or undergarment. Wearing a head covering which is only worn by the men. Performing “mitzvot”: Mitzvot means commandments. “Doing mitzvot” is doing good deeds. Attending Synagogue: This predates the destruction of the Temple, and is foundational in Jewish life. Most, but not all will be segregated by gender with the men being separate from the women in the congregation. Ritual sacrifice is replaced with Torah readings, prayer, and teaching. Synagogue is normally attended on the Sabbath and the holy (or feast) days. Bar & Bat Mitzvah: a “coming of age” ceremony when a boy of 13 or a girl of 12 is recognized by Rabbinical law as an adult. Orthodox Judaism has historically only had bar (boy) mitzvahs and not bat (girl) mitzvahs. This is starting to change in the Orthodox world. In speaking with an Orthodox Jew, there are definitely common beliefs which we hold, such as God’s existence and position as the Creator, the divine authorship of the Hebrew Scriptures (at least the first 5 books), and that those Scriptures teach of a coming Messiah. It is best in witnessing to any Jewish person, that it be done tactfully and respectfully – using the common beliefs that we hold as “springboards” or points of discussion. As mentioned earlier in this article, even within the Orthodox movement itself, there are so many varying beliefs. This is why it is very helpful to ask questions! Your Orthodox friend may believe in a personal Messiah, or he may entirely reject the divine authorship of the prophets. You will never know where he stands until you ask! Once you find out where his individual beliefs lie, you will know how to proceed. For instance, if he feels that the prophets don’t hold much weight, you can show him prophecies about the coming Messiah from the books of Moses (the Torah). In general, Orthodox Jews have a very high reverence for God and His Word, and a belief in a coming Messiah. This is very advantageous in sharing with them the truths regarding the Messiah. 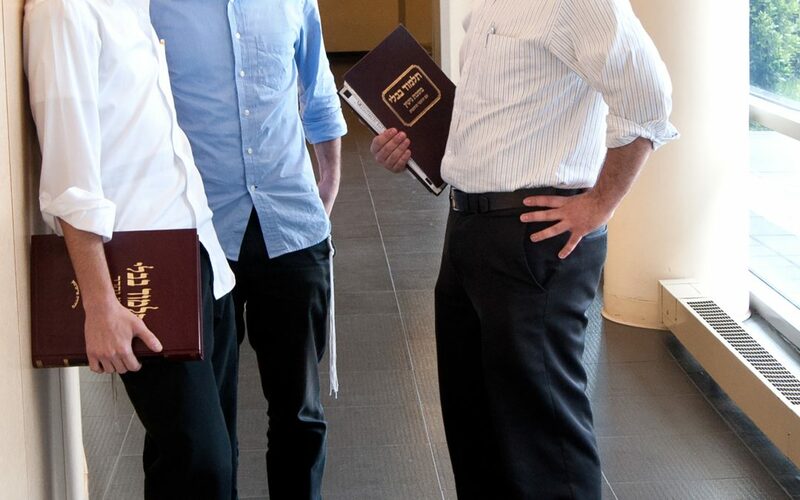 When we view Jewish people within the mainstream of traditional rabbinic Judaism, we will be able to see a very real and tangible history of transition, teachings, and tradition that will bridge the gap between Sunday school stories and synagogue. May we in light of this understanding, be better equipped to share Jesus the Messiah with these for whom Jesus died! Deuteronomy 10:6 and Jeremiah 4:4 both emphasize a right heart inclined to seek and obey the Lord. Jesus said in Matthew 15:8 that the Pharisees honored God with their lips, but that their heart was far from Him. Genesis 3:15; 12:3; Chapter 18 & 19; 22:8-14; and 49:10 are all great passages to discuss the coming of the Messiah, and God taking on flesh.